Since racks tend to contain very heavy items and full pallets, falling items are a considerable danger. Because they’re tall by design — some are over 30′ tall at the highest beam level — the dangers are amplified. Anything falling from the top of a high bay is going to not only be destroyed, but has the potential to injure people and break things when it lands. What steps can you take to reduce these risks? A great many rack collapses and instances of falling items have to do with the way the rack was loaded. You can make a huge difference by simply loading the rack the way it was intended to be loaded. Make sure your lateral pallet spacing is right: If your pallets are too close together, it’s harder to access them with a forklift. This increases the likelihood that a driver will make a mistake and bump an adjacent pallet, sending it to the floor. The industry standard is that your beam width (side-to-side) should be greater than your maximum total load width plus 12″. In a scenario of two pallets with a maximum width (including their loads) of 42″ each, you’d need a beam of at least 96″ wide (2 x 46 = 84″ + 12″ = 96″). That provides 3″ on each side and 6″ between the pallets. Don’t skimp on that extra lateral space. It helps prevent your drivers from knocking a load, a pallet, or even an entire rack down. National fire codes require a minimum 6″ flue space between loads. That should be the very minimum. 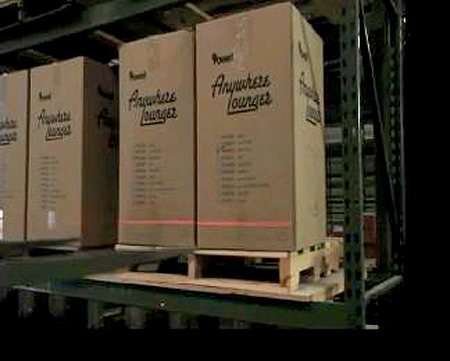 See “Fire Code Compliance and Pallet Racks” for more information. Provide plenty of vertical space, too: When it comes to space between beams, it’s important to regulate the overall height of your loads vs. the beam spacing in your rack system. The industry recommends that you should have a minimum of no less than 10 inches. Leave your drivers plenty of space to maneuver pallets as they load and unload. If your inventory mix changes, be sure your new pallets don’t exceed your beam spacing, and don’t allow the 10″ cushion to be compromised. Light your warehouse: Dark conditions contribute to errors, and errors can result in a bunch of expensive inventory on the floor. Although rack aisles are notoriously difficult to light, modern lighting systems tend to be offset by energy savings and tax credits. Don’t use ratty pallets: Pallets that are about to come apart are more likely to cause a product dump. Make sure your pallets are in good condition and rated to handle your unit loads. Store the heaviest items in the lower bays or on the floor level: This is common sense, but in a rack where there is a mixture of loads (say, bottled water and pillows), store the high density, heavy stuff on the ground and the pillows at the highest levels. This helps make your rack more stable and makes load/unload errors at the top less critical. Train for better outcomes: If your drivers are loading expensive inventory, it’s a process to ensure it’s being done the way you want. 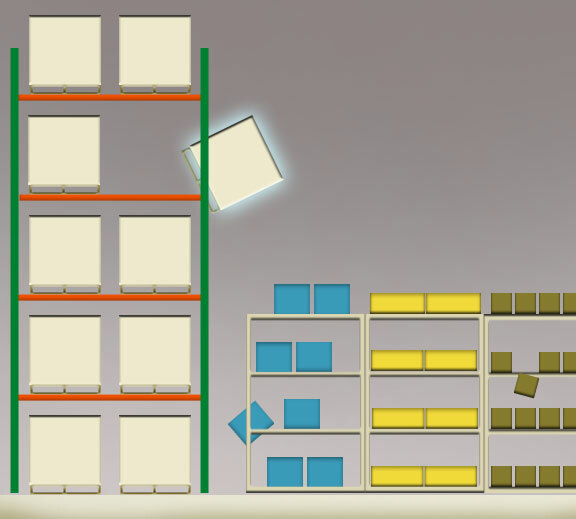 You should have a specific process for loading/unloading to help reduce the chances of falling items. When you do forklift training, break down the various processes (how to deal with pedestrian crossings? How fast should I drive? How do I enter and depart truck trailers?). Load your racks evenly, with the load s centered. 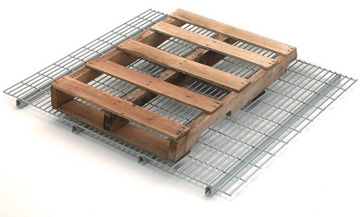 Many racks have wire deck or pallet supports that help them take nonstandard or undersized pallets. This is helpful, but if you misapply the load, loads can fall.The center of gravity for your pallets should not be focused on the front part of the beam level, as this pulls the rack forward. Some helpful articles on this include: “A Guide to Rack Load Types”, “When Racks Collide”, and “Pallet Rack Beams are Affected by Loading Patterns”. Stack your pallets right: No matter the quality of the rack, or how carefully it’s loaded, items can fall from a poorly stacked pallet. Be sure you stack heavier cartons or loads on the bottom layer. Be sure loads are centered on the pallet as evenly as possible. If you receive pallets from a third party, demand that the loads are properly stacked, with product balanced in ways that don’t risk a collapse. Inspect incoming loads and train your people the best ways to ensure a good pallet goes up on the rack. You can also shrink wrap or band your pallets to help them hold together. This article does not address falling items and seismic activity. See our comprehensive guide to warehousing and seismic zones. Inspect your racks regularly: See “A Guide to Pallet Rack Inspections” for more information. Be sure there are no bent frames, no missing beam clips, no hardware out of place. This should be done frequently and consistently. Report all incidents: Make sure people report any rack collision, even if there isn’t any apparent damage. Many companies make these collisions “no fault” to ensure that drivers can report them without fear of reprisal. You want to know as soon as you can if an upright has been compromised. Specify the right rack: If you are in a seismic zone, be sure to adhere to comply with regulations. We have an online guide for this, but you should always consult a rack professional if you’re erecting a rack system in an earthquake zone. Post your capacities: Label systems are inexpensive and easy to apply. Be sure that you get assistance if you change the storage mix, as pallet rack capacities are dependent on beam spacing, establish processes to be sure racks aren’t loaded with new items without checking their size/capacity beforehand. Use column and upright guards: It’s always a good idea to take the most basic protective measures. Guards range from simple steel frame protectors that bolt to the floor to poly guards that surround the posts with a “cushion of air.” Whatever you choose, use something to protect those posts. It almost always pays off. These safety measures are commonly used, relatively inexpensive, and deliver return-on-investment both in the product damage and safety arenas. You should install fall protection on high bays that overlook any work or traffic area, due to employee safety concerns. High value inventory, or areas that are frequently accessed by lift trucks also warrant protection. Even a small carton that’s knocked off a pick bay from 20+ feet high can pack a punch when it hits the ground, or some unfortunate person below. Aside from that, of course, the inventory is damaged or destroyed. 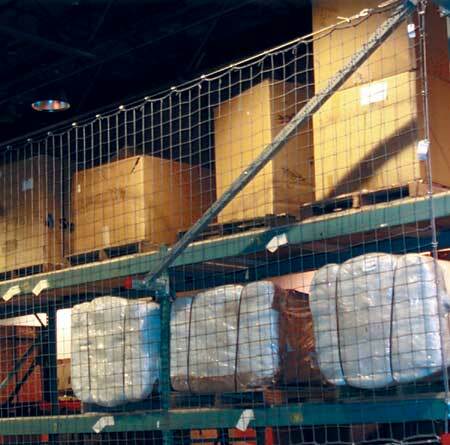 Rack safety nets: These nets are flexible and can help catch a carton if it’s inadvertently knocked off a stored pallet. In some cases, they can help prevent a misloaded pallet from pushing through the back of the rack and spilling onto the floor. 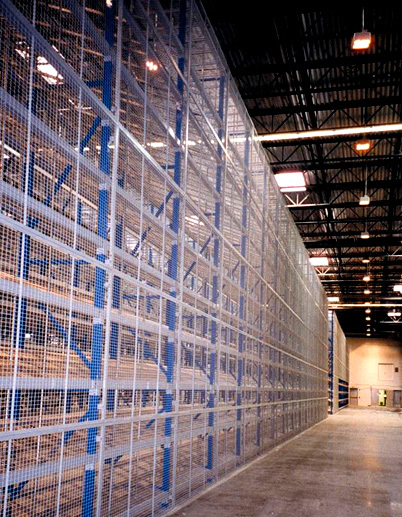 Nets can be installed in dozens of standard and nearly unlimited custom configurations. They’re rated for loads weighing from 1,250 lbs. to 10,000 pounds. You can install them flat or offset to the back of a rack. Wire mesh back panels: These serve the same general purpose as netting, but are more substantial. They will not flex to catch a falling box, but instead are rigid and stop it from sliding past a certain point off the back of a rack storage position. They’re built from 2″ x 2″, 10-gauge welded wire mesh and securely welded into a 1-1/4″ x 1-1/4″ x 1/8″ angle frame. For more information, see “Comparing Pallet Rack Guards”, which examines the differences in these items. Improve visibility as stored loads are accessed: One excellent new tool that helps drivers load a rack is the forklift positioning laser. These systems align with the fork tines and shine on the pallet in front of the forklift, providing a guide line showing the forklift operator the position of the tines at all times. Be sure the lifts don’t have solid tops or other impediments to visual inspection as they access your pallets.